Back Row, Left to Right—T.H. Russell, W.Y. Evans, John J. McAleer, A. Quimby, Peter V. Ludy, John F. Bickford. Front Row—John C. Woodbury, H.S. Hobson, W.M. Smith, William H. Giles, Martin Hoyt, Patrick McKeever. On the50th anniversary of the famous battle between the U.S.S. 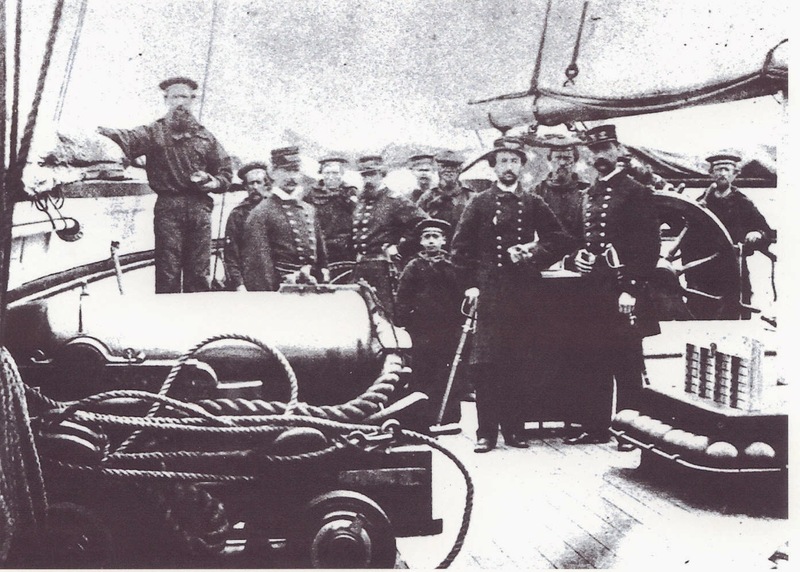 Kearsarge and the Confederate battleship C.S.S. Alabama off the coast of Cherbourg, France, June 19, 1864, the members of the United States Steamship Kearsarge Association yesterday afternoon held a reunion and dinner at the American House in Boston. Of the 22 men who are know to survive from among the 163 officers and men who participated in the conflict, 13 were present at yesterday’s banquet. Many were accompanied by wives and children, who, with the guests, brought the total number at the dinner to 24. William Smith of Cambridge, a colored veteran, was present with his former comrades for the first time since he was mustered out 50 years ago. Mr. Smith, who is 66 years old, is still pretty active and does light work to keep himself in condition. Though he has lived about Boston since the war, he never before attended an association reunion. President Patrick McKeever introduced the speakers including Major General John E. Gillman of the Soldiers’ Relief Committee, who was asked to speak by Mayor Curley, as the latter sent his regrets; Andrew Houghton of the Kearsarge Association of Naval Veterans, a separate organization; Dana King of Post 156 G.A.R, Everett: Dr. John Dixwell, a physician of the Kearsarge Association of Naval Veterans and Edwin O. Foster of Salem, an honorary member. Letters were read from Daniel B. Sargent of Omaha, James Kerrigan of San Francisco and John O’Dlorne of Tilton, survivors, and another from Mrs. Kate B. Smith of 90 Elm Hill Ave, Roxbury, whose Husband, also a survivor, recently died. The following members were present: Patrick McKeever of Malden who was reelected president: Austin Quimby of Salem; William Y. Evans of Gilmanton, N.H.; Henry H. Hobson of Palmer; Martin Hoyt of Manchester, N.H.; William G. Giles of Dayton, N.J.; John J. McAleer of Cambridge, who was elected secretary; George Henry Harris of the Soldiers’ Home, Chelsea, William Smith of Cambridge, John C. Woodbury of Beverly, George A. Russell of Lawrence and Charles H. Poole of Waltham. 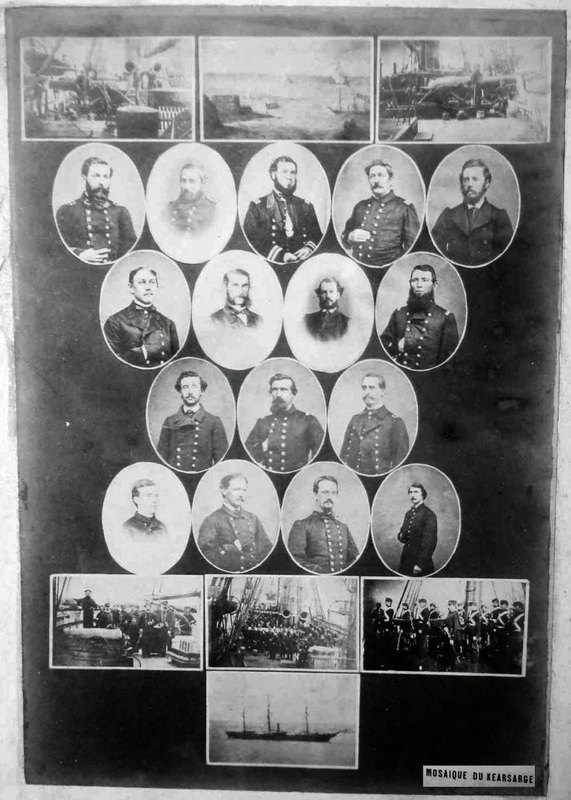 Photos of USS Kearsarge and crew taken in June 1864 after the battle with CSS Alabama by Francois Rondin, a photographer in Cherbourg, France.